"Drowning is not the violent, splashing, call for help that most people expect. Drowning is almost always a deceptively quiet event. The waving, splashing, and yelling that dramatic portrayals prepare us to look for, is rarely seen in real life. "The Instinctive Drowning Response-so named by Francesco A. Pia, Ph.D.-is what people do to avoid suffocation in the water. And it does not look like most people expect. There is very little splashing, no waving, and no yelling or calls for help of any kind. Except in rare circumstances, drowning people are physiologically unable to call out for help. The mouths of drowning people are not above the surface of the water long enough for them to exhale, inhale, and call out for help. When the drowning people's mouths are above the surface, they exhale and inhale quickly as their mouths start to sink below the surface of the water. "Drowning people cannot wave for help. Nature instinctively forces them to extend their arms laterally and press down on the water's surface. Pressing down on the surface of the water, permits drowning people to leverage their bodies so they can lift their mouths out of the water to breathe. Drowning people who are struggling on the surface of the water cannot stop drowning and perform voluntary movements such as waving for help, moving toward a rescuer, or reaching out for a piece of rescue equipment. "So, if a crew member falls overboard and everything looks OK, don't be too sure. Sometimes the best indication that someone is drowning is that they don't look like they're drowning. They may just look like they are treading water and looking up at the deck. One way to be sure? Ask them, "Are you all right?" If they can answer, they probably are. If they return a blank stare, you may have less than 30 seconds to get to them. And parents - children playing in the water make a lot of noise. When they become quiet, find out why...right away." US Sailing, the premier sail boating association in the United States, has just accredited Sail Chicago as one of its official sailing schools. US Sailing's mission is to "Provide leadership, integrity and advancement for the sport of sailing." Sail Chicago Board Chairman Chris Schuler says, "This is a testament to the dedication and hard work of our instructors and is the beginning of a new era for Sail Chicago." Watch future issues of Between the Sheets for more news about how this accreditation will impact Sail Chicago. Our thanks to Chris for shepherding us through the long and sometimes arduous accreditation process! Our Ideals are fast, light, and fun to sail. If you're a skipper but are not yet authorized to sail an Ideal, a one-session orientation should get you qualified. Our Ideals are the only boats that we're allowed to sail single-handed (after a two-session on-the-water course), a fun challenge for skippers. To sign up for an orientation on an Ideal, contact Peter Dudak to arrange a mutually convenient time. Tiller Time is a great way for students to practice the sailing skills they learn in their formal instruction programs. We need more qualified Tiller Time Skippers to help with this. Remember, if you skipper five or more Tiller Times, you'll complete your annual service requirement and receive a $50 sailing credit. But by far your greatest reward will be to pass on your sailing skills to eager Sail Chicago students. To sign up, please contact Anke Heinrich. SKIPPERS AND MATES--SHULER SCHOLAR PROGRAM NEEDS YOU! As part of its outreach to other not-for-profit charitable organizations in the Chicago area, Sail Chicago has recently partnered with the Schuler Scholar Program to provide opportunities for high school students in that program to gain on-the-water experience and develop their sailing skills. We are looking for skippers and first mates who could volunteer to take three students and a Schuler supervisor on a Wednesday afternoon Colgate sail from approximately 1 - 4 pm. The program will run through August 13. Volunteers can commit to one or more dates. If you're interested or have questions, please contact Tom Simms. We have had more than our share of unusual weather this summer. Between the fog, rain, cold, high winds, and thunderstorms, it has made it a challenge to find a summer-like weather window for good sailing. The good thing is that with the advent of smart phones, we can access excellent weather information in real time. And all of the weather forecasting organizations use social media to broadcast forecasts and up-to-the-minute warnings during severe weather events. Combining these resources can help you plan a safe sail. It might be a little wet, or not as sunny and warm as you would prefer, but this is Chicago! The US National Weather Service Chicago Office maintains a great Facebook feed. It is an excellent source for information about impending weather. Tom Skilling also uses social media extensively. He regularly posts in-depth analyses of short and long term forecasts. There are a host of good smart phone radar apps. I like Radar Now, available for both Android and iPhone. It provides a radar loop that is within a few minutes of current time. It can be helpful for monitoring storm trajectories and timing of weather events in our sailing area. Neither apps nor social media can help if you are fogged in while sailing, however. It's always good to keep track of your location and the bearing to a location near the harbor so you can retrace your course using the compass. It helps to post someone on the bow to listen for approaching vessels and assign the rest of your crew to look to either side. If the fog is really dense, sound the fog horn once a minute. None of our boats are equipped with radar, so sailing in the fog is something that should be undertaken with great care. Finally, click here for a link to a great explanation of the two storms that blasted through our area on Monday, June 30. The Harrison-Dever crib gauge recorded a 53.1 knot (61.1 mph) gust at 7:30 PM. The seaworthiness of our Sail Chicago fleet has always been among our top priorities. Occasionally accidents or incidents will occur that may possibly impair the seaworthiness of one of our vessels. Rather than take a chance that there may be a significant problem with a boat after an accident or incident below the waterline, the Board has decided to have the boat immediately removed from service until an adequate inspection of any damage can be made. "Collision" - defined as when a Sail Chicago boat strikes or impacts with another boat or object, regardless of whether damage occurs. The underwater "contact" of a boat, particularly the keel, shall be included in the definition of "collision" and shall require the examination of said underwater areas to determine their seaworthiness. In the event of underwater contact with the hull, keel and/or rudder, the skipper must immediately terminate the sail and return to the mooring if it is safe to do so. In no case shall he/she continue to sail the boat." The part in italics has been added to the definition of "Collision." Any time there is any underwater contact with an object, the sail MUST be terminated and the boat taken out of service. Sunday, June 20, was the date of Sail Chicago's first-of-the-season Friends and Family Picnic. Organized by social Coordinator Pat Webster, the event has become a highlight of our sailing season. This year, almost 100 Sail Chicago members and friends registered for the picnic, held at Belmont Harbor, close to where our cruising boat, Priorities, is docked. "This is by far the largest number of people registered for the event that we've ever had," remarked Webster. The day dawned rainy. By 1 pm when the picnic started, the rain had stopped, but a dense fog coated the near-shore area. One of our Colgates that had been scheduled to sail up from Monroe Harbor had to abort the effort because of the fog, but by 1:30 pm when two of the boats in our fleet were ready to take picnickers out sailing, visibility had cleared, and the boats left the dock filled with happy people. As usual, all the fixin's for the picnic were delicious. The brats and burgers were cooked just right, and the home-made salads were delicious. Of course, what would a picnic be without watermelon and cookies for dessert? Many thanks to Pat Webster and her great crew for all the work they did in putting together this wonderful event. And don't forget to join us on Sunday, August 3, for another Friends and Family picnic. Watch for details in future announcements. Both of our Rhodes 19's now have new, bright blue covers for the main sail so the main sail can remain on the boom, which shortens the process of rigging and de-rigging. Also, Two Fish now has a 3.5 horsepower motor so that we no longer have to worry about becoming becalmed or caught in a storm and unable to return to the harbor.! Come and try out our upgraded Rhodes 19s. I think you'll enjoy them! A near-shore floating entertainment complex called "Breakwater Chicago" may be coming soon to Lake Michigan. It's being described as a destination for boaters featuring restaurants, spas, shops, lounges, event spaces, and even swimming pools. Sail Chicago member, Beau D'Arcy, is a principal in the start-up that is moving the project forward. For more information about the project and to see an artist's conception, go to the Chicago Tribune article here or visit the Breakwater website. Sail Chicago's formal application to US Sailing was submitted (we received news after the Board meeting that US Sail has accepted our application!). Reviewed the May financial statements, noting that we are in a solid financial situation and that the membership goal has been exceeded. Instruction is having a solid season, already on par with year ago figures. Sail Chicago is in need of a Cruising Director for Priorities; Chris Schuler is temporarily managing. Any interested and qualified candidates should contact Chris. We are also seeking to offer more regular member cruise outings (MCOs) on Priorities; ideally Wednesday and Saturday evenings, as well as a weekday. Skippers are encouraged to volunteer to lead these outings. The Board agreed with the Safety Director's recommendation regarding grounding procedures. Any vessel that makes contact with an underwater obstruction must be immediately taken out of service until it has passed inspection to establish the extent of damage and to ensure seaworthiness. There is one 2 year open Board of Directors position open. The board approved the Bosrd Development Committee's recommendation of four candidates. Candidates will be contacted in order of preference, until a candidate accepts. HAVE YOU BEEN IN A FOG LATELY? 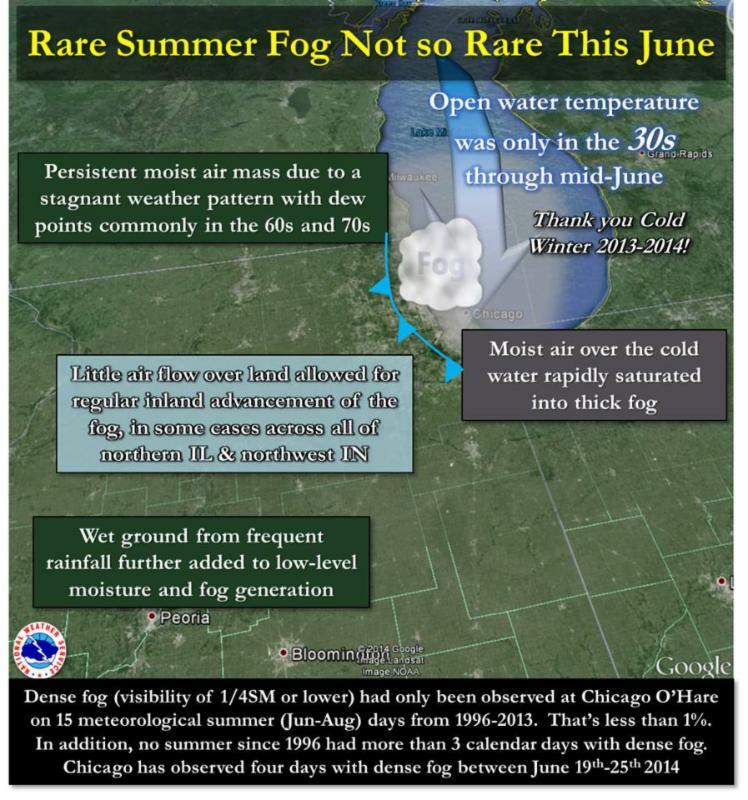 Have you had to cancel a sail in June because of a fog on Lake Michigan, or worse yet, been caught on the lake as a fog rolled in? Are you wondering why we've had so much fog? Well, the U.S. Weather Service has an answer. To find out more, click here.